Florida, full of sun and palm trees, is always a popular travel destination. If you're looking for an alternative to the steamy hustle of Miami or the theme park energy of Orlando, Jacksonville remains much more of a hidden gem. The largest city by area in the U.S., Jacksonville enjoys wide-open spaces and operates the largest urban park system in the country. Centered on the St. Johns River, the city's extensive waterways draw residents and visitors alike for a variety of water sports and leisure activities. And with modest prices and room to grow, Jacksonville is attracting a burgeoning arts scene, and hosts major music festivals and cultural events throughout the year. Using travel site Skyscanner, we've sifted through the cheapest flights between Raleigh and Jacksonville in the next few months, including some top-rated hotel options and beloved local attractions. The cheapest flights between Raleigh and Jacksonville are if you leave on November 28 and return from Florida on December 1. American Airlines currently has roundtrip, nonstop tickets for $171. American Airlines also has tickets at that price point in December. If you fly out of Raleigh on December 15 and return from Jacksonville on December 18, American Airlines can get you there and back for $171 roundtrip. Regarding where to stay, here are some of Jacksonville's top-rated hotels, according to Skyscanner, that we selected based on price, proximity to things to do, and customer satisfaction. If you're looking to splurge on top quality, consider The One Ocean Resort & Spa. The hotel has a 4.8-star rating on Skyscanner, and rooms are currently available for $179. A second option is Hyatt Regency Jacksonville Riverfront. With a 4.6-star rating on Skyscanner, the hotel is one of the most luxurious in the city. Rooms are currently listed for $139/night. Don't miss Jacksonville's food scene, with plenty of popular spots to get your fill of local cuisine. Here are two of the top-rated eateries from Skyscanner's listings. If you're looking for a local favorite restaurant pick, head to Ruth's Chris Steak House, with five stars from 11 reviews. Also worth considering is Salt . One of five dining options at the Ritz-Carlton, Salt features simple and elegant flavors in a coastal setting. "Salt is located in the Ritz Carlton and is a wonderful special occasion restaurant," wrote Rita. 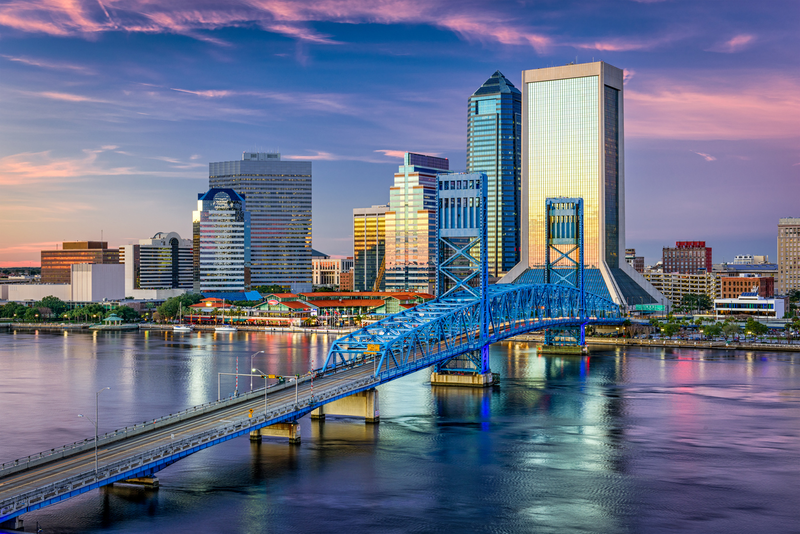 To round out your trip, Jacksonville offers plenty of popular attractions worth visiting. Here are a few top recommendations, based on Skyscanner's descriptions and reviews. The top-rated visitor attraction in Jacksonville, according to Skyscanner, is The Amelia Island Trail. Next, consider checking out Fort Clinch State Park. "Ride it, bike it, or walk it, it is a beautiful park with so much nature to see," wrote visitor Marian. "The fort itself is worth a day of exploration."